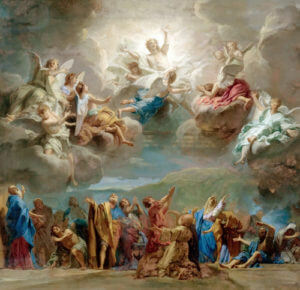 Prayer Meditation for The Ascension - My Catholic Life! O Lord Jesus, I adore you, Son of Mary, my Saviour and my Brother, for You are God. I follow You in my thoughts, O first-fruits of our race, as I hope one day by Your grace to follow You in my person into heavenly glory. Until then, do not let me neglect the earthly task which You have given me. Let me labour diligently all my life with a greater appreciation for the present. Let me realize that only by accomplishing true human fulfillment can I attain Divine fulfillment and ascend to You at the completion of my work.